It relieves joint stiffness and pain caused by arthritis as it reduces enzymes associated with the pain and cartilage damage. It speeds up the healing process. Therefore, applying cod liver oil ointment helps heal wounds as well. Loaded with vitamin D, cod liver oil promotes cognitive performance and maintains proper brain function during old age. Being a good source of omega-3 fatty acid, cod liver oil helps prevent coronary atherosclerosis by improving HDL levels and reducing LDL levels. The vitamin A and D in the oil also maintains the elasticity of blood vessels and improve functionality of the heart muscles. Vitamin D and omega-3 fatty acids have synergistic anti-cancer effects and help prevent various types of cancer such as that of the prostrate, lungs, as well as lymphoma and skin cancer. This vitamin D-rich oil reduces the likelihood of fracture in old people. It prevents and treats rickets in children, a condition caused due to deficiency of vitamin D.
It relieves muscle and bone pain caused due to the deficiency of vitamin D. Cod liver oil increases the vitamin D level in the body thereby increasing muscle strength. Vitamin A-rich cod liver oil helps maintain healthy vision for the long term and also treats other vision-related problems in people. The omega 3 rich cod liver oil boosts immunity helping you stay away from several infectious diseases. The oil is useful in maintaining healthy skin due to its omega 3 rich composition. 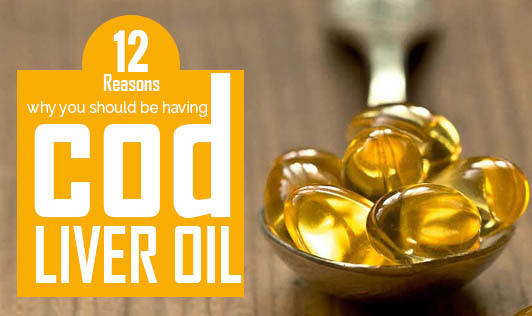 Regular consumption of cod liver oil keeps your skin glowing, radiant, and younger looking for a longer time period. It is also known to minimize wrinkles. Cod liver oil moisturizes and softens dry skin, making skin appear shiny and healthy.